Data Practices Trainings: Not Just in the Metro! 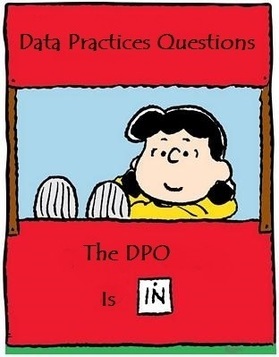 Did you know that you can get FREE training from the Data Practices Office? All you have to do is pull together a large group of diverse and interested people! Our office is too small to provide specialized data practices and open meetings training to each and every Minnesota school district, city, county and agency that doesn’t have a statewide reach. However, if your office can join up with other surrounding entities and pull together a sizable group, we can offer a 60-90 minute training for relevant staff - at no cost! We believe that the public will see greater government transparency and accountability when entities have a better understanding and grasp of these important, but at times complicated, laws. But – we also want to educate the public about data practices and open meetings! If your non-governmental group or organization is interested in receiving training, please let us know. Sometimes an hour overview of the law isn’t enough for government staff who work closely with these laws. For this reason, we also offer half-day and full-day, high value, hands-on workshops. Because these value-added workshops require a more in-depth and hands-on experience, we do charge a fee to recoup our costs in providing them. The feedback we receive consistently from workshop attendees is that they are extremely helpful and beneficial. Visit our Events page for more information about our workshops. Please reach out to us for more information about our training program at info.dpo@state.mn.us. In Advisory Opinion 18-008, a county asked about the classification of an investigative report about an elected county sheriff. The Commissioner agreed with the County that the sheriff was a public official employee and that “retirement” is a form of “resignation.” As such, all data about the complaint became public when the sheriff retired while the complaint was pending, per Minn. Stat. § 13.43, subdivision 2(f) and (e) (excepting not public data about other individuals). In Advisory Opinion 18-009, a member of the public asked whether a state agency had violated the Data Practices Act because it denied him access to the data he requested (school building radon testing/mitigation data). The agency stated that per Minn. Stat. § 13.3805, subdivision 5, data it maintains that “identify the address of a radon testing or mitigation site, and the name, address, e-mail address, and telephone number of residents and residential property owners of a radon testing or mitigation site, are private data on individuals or nonpublic data.” The Commissioner agreed with the agency that data it maintains that identify the location of any radon testing or mitigation site, regardless of the type of property, including school buildings, are nonpublic. However, the same type of data that entities other than the agency maintain are not classified by § 13.3805, subdivision 5. In Advisory Opinion 18-010, a data requester asked whether a school district had responded appropriately to several data requests he made, including one for data about himself. The Commissioner opined that the district did not respond appropriately to the requests for public data in these specific circumstances when it did not communicate with the requester in nearly five months, despite the fact that the district knew that some data the requester sought no longer existed. The Commissioner further opined that the district did not respond appropriately to the requester’s request for data about himself because it did not provide him with any data within ten business days, as required by Minn. Stat § 13.04. In Advisory Opinion 18-011, a member of the public asked whether a town board had violated the Open Meeting Law (OML) by not providing, in the public packet of members’ materials, a copy of a document the board discussed. The Commissioner acknowledged that the document was available to the public at an earlier meeting, and that the board read it aloud at the meeting in question. The Commissioner concluded that nonetheless, the board violated the OML by not having a least one public copy of members’ materials available to the public, as required by Minn. Stat. § 13D.01, sub. 6. The Commissioner granted a request from the City of Rochester to temporarily protect, as not public, certain rideshare data. The classification is effective immediately, but has been submitted to the Attorney General to review for form and legality. The Attorney General must act on the classification within 25 days. Three sets of plaintiffs sued several City of Victoria council members and the mayor in separate lawsuits alleging violations of the Open Meeting Law (OML). The district court consolidated the complaints into one case. Ultimately, the district court found that the respondents had violated the OML and imposed fines accordingly. The court declined to remove the respondents from office per Minn. Stat. § 13D.06, subdivision 3(a), which provides that any person found violating the OML in three or more actions forfeits the right to serve on the body for a period of time equal to a term of office. The Court of Appeals affirmed the district court’s decision not to remove the respondents and the Supreme Court affirmed the Court of Appeals. Based on the plain language of § 13D.06, subd. 3(b), the court held that in order for the forfeiture provision to apply, the statute requires the court to a find “the occurrence of a separate third violation, unrelated to the previous violations.” The court stated, “[allowing] three concurrently adjudicated actions to trigger the forfeiture-of-office provision would deny effect to the word ‘previous’ in subdivision 3(b)." SOS denied access to the requested voter data stating the data were not public pursuant to Minn. Stat. § 201.091, which restricts public access of voter records 1) to certain voter record data, and 2) for purposes unrelated to elections, political activities, or law enforcement. Plaintiffs clarified that they were not asking for restricted data, and both parties agreed that plaintiffs' request related to elections. The Court granted plaintiffs’ motion for summary judgment because defendants failed to identify a statutory classification for the data in the SVRS. The Court cited Advisory Opinions 00-038 and 12-016 to support its conclusion that the data at issue are presumptively public. The Minnesota Court of Appeals affirmed a lower court’s ruling that school security camera footage was private educational data under Minn. Stat. § 13.32. In denying the student newspaper’s attempt at securing the video footage, the court held that the video constituted “educational data” that was “maintained” by the school district because security video depicting identifiable students was data that “relates to a student." The court declined to address whether the video was protected by FERPA because it was properly classified as private under the Data Practices Act.